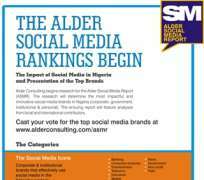 Alder Consulting, the Creative Intelligence Company is set to introduce another landmark report - the Alder Social Media Report (ASMR). The Alder Social Media Report (ASMR) is a presentation of Nigeria's most impactful and innovative social media brands (corporate, government, institutional and personal). The comprehensive report will feature articles and analyses from local and international contributors. The polls have commenced and the final report is due in December, 2013. This is a call for the public to participate in the polls. Social Bakers, an analytics company reports that between 2012 & 2013, Facebook users in Nigeria grew from 5.5 million to 11 million, making it one of Facebook's fastest growing markets and largest political advertising markets. Webtrendsng.com, a news website posits that there are 48 million Nigerians on social media. The Alder Social Media Report (ASMR) will provide information on the influence of mobile penetration on social media growth in Nigeria.